Frequency demodulation or detection can be obtained directly by using the PLL circuit. When the centre frequency of the PLL is selected or designed at the FM carrier frequency, the filtered or output voltage in the circuit shown in figure, is obviously the desired demodulated voltage, that varies in magnitude inÂ proportion to the signal frequency. 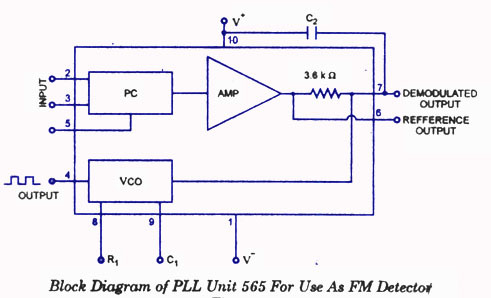 The PLL circuit thus can be operated as complete IF strip, limiter, and detector as employed in FM receivers. 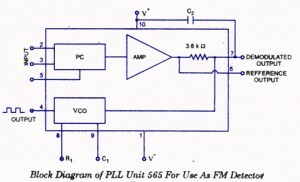 The 565, very popular PLL unit, containing a phase comparator PC, amplifier, and VCO, is shown in figure. PC, amplifier and VCO are only partially connected internally. An external resistor R1 and capacitor C1Â are for setting free-running or centre frequency of VCO and another external capacitor C2 is for setting low-pass filter pass band. VCO output is connected back as the input to the PC so as to close the PLL loop. Power supplies used are two (V+ and V-). Can I use the same IC to synchronise two sine waves ? ie one sine wave to follow the other in phase and frequency so that both of them can get added up.